Bigtwin Custom Bike Show 2018 - One week to go! the Bigtwin Show is staged in the Houten Expo. Not the biggest in Europe, but for sure one of the best! 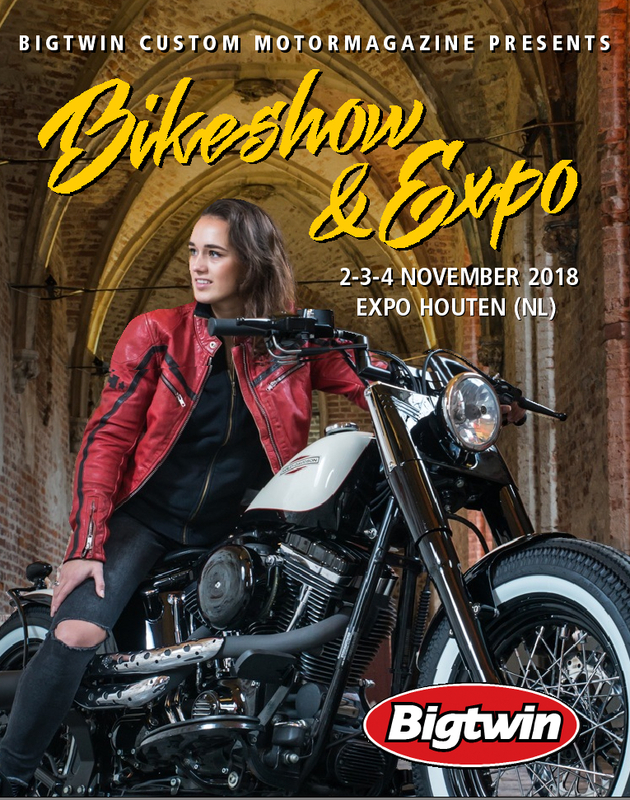 What can you expect at the famous Bigtwin Bikeshow & Expo 2018? A Custombike Show with almost 100 of the best custom bikes from Europe, entries coming from as far as Russia, England, Italy, Slowakia, Belgium, Germany and of course Netherlands' finest will be present. Striptease shows, Biker Buil-off, Live demo's, Good bands, lot's of vendors, big companies like Zodiac International, Parts Europe, Custom Chrome Europe, Motorcycle Storehouse and many more. New and used parts. Good food and drinks, friendly people. Experience it yourself, lot's of fun guaranteed! In an AMD World Championship first, respected German retailer Detlev Louis sponsored a public choice vote, with the win taken by Szajba’s Garage of Poland - a clear choice taking more than 10 percent of the hundreds of votes cast. Staged as the lead feature at ‘INTERMOT Customized’, the show-within-a-show concept created to showcase custom industry excellence at INTERMOT (Cologne, Germany, October 3-7 2018), the AMD World Championship was widely praised by exhibitors and visitors alike as delivering an inspirational and aspirational show environment that champions the outstanding craftsmanship and innovation of the international custom motorcycle market. Bulletproof styling for Sportsters and a variety of multi-fit applications. The new Kuryakyn® Dillinger collection showcases tough-as-nails industrial styling through a variety of accessories available for Harley-Davidson® Sportster-specific and multi-fit applications. Signature Dillinger design cues incorporate unique pass-through styling with rugged modular construction and contrasting finishes that blend smooth and textured surfaces. Finish options include satin black or satin silver with zinc dichromate plating on all visible socket head cap screws to add distinctive contrasting elements..
Dillinger Footpegs are available with male-mount splined adapters as direct replacements for most H-D models, or without splined adapters for a variety of fitment using Kuryakyn’s model-specific adapters. The all-aluminum construction features a raised top surface for traction and unique pass-through design to produce a lightweight and sturdy foundation for secure footing. Complementing the look is the Dillinger Shift Peg, available as a direct replacement for all H-D models. Available for a variety of H-D models with 5-3/4” headlamps, the Dillinger Headlight Trim Ring is a direct replacement for stock cast from durable lightweight aluminum. The grilled design can be run horizontally or vertically and gives the front end a killer new appearance in minutes. Additional Info One grade 5titanium beam frame and frame hangers. Rare wheel converted to tack shaft drive .45 degree drive box heavily modified to take in board brake. FMW Motorcycles with ‘Hurakan’ is Winner Cafe Racer class in the AMD World Championship Custom Bike Builder 2018! FMW Motorcycles is Winner Cafe Racer class in the AMD World Championship Custom Bike Builder 2018! The Cafe Racer class in the AMD World Championship Custom Bike Builder was won by FMW Motorcycles with ‘Hurakan’, an S&S Superstock Avon Tyre-shod 1968 Shovelhead. AMD World Championship Custom Bike Builder, Cologne, Germany. At the Intermot Customized, here's an impression of the best bike show ever!